How the hell do you run practices when your league has practicing membership from Level CobraSnake to Level NewbornFoal? THIS is the biggest question asked across the world by coaching committees in roller derby right now. How can we keep our vet skaters challenged and satisfied with the training process [so they don’t transfer out] while bringing new skaters up [quickly] to a level to be able to play with those vets? I had such a huge response to the blog I posted two days ago, about League Rebuilding that I wanted to make sure that my blog about training the leagues that are rebuilding went up quick! There are fundamental corners to The House that Derby Built: Skills, Teamwork, Strategy, and Health. Without one of the corners, the house will not fall, but it will lean a little funny. Without two of the corners, you don’t have much of a house. First you need to understand where your league is at with each of these fundamental pillars. The first step is to take an honest look at where each skater is individually and as a league. For Skills and Health you can actually do measurable tests to help you with your mapping process. Set up a practice to set benchmarks and test skills, and I would recommend asking coaches from nearby leagues to come in and help with the ranking process, since the will be more impartial in the process. Create a list of skills (crossovers, one foot glides, lateral motion, hip checks while moving, jumping, counter blocking, 180 toe stops, blocking to the line, etc) and have them ratable 1-10. Move your way through drills, as you would when doing a certification, but make sure you have more advanced skills on the list than a strict certification process. For Health, you simply create a list of ‘events’ like a football combine. 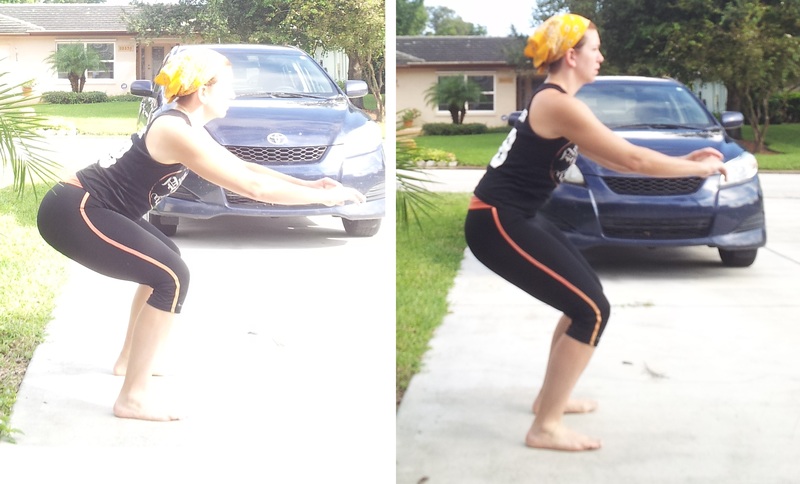 You can test squat strength, bench strength, 100 yard dash, 400 yard dash easily. You can create short ‘obstacle courses’ and time each player through it while rating their cuts, bursts of speed, jumping, and footwork. You can do one foot balance, long jumps, pull-ups, or anything else you think would be applicable to strength and endurance needed for derby. Once you have your 1-10 data points you can put them into a spreadsheet and simply create a point chart! Boom. You now know where people are. This is not to make anyone feel bad. This is simply a way to benchmark individuals so that the training staff can develop upcoming practices and make recommendations about cross-training. This information is also a great starting point for goal setting! Part of setting goals is that they have to be MEASURABLE. With benchmarks in hand, captains can meet with skaters to create a real list of SMART goals for the skater to focus on in upcoming months. To benchmark Teamwork and Strategy is harder. Teamwork, though very easy to see the presence (or lack of) teamwork, it is not easy to quantify. You may want to ask those coaches to come and observe your team in a scrimmage against another league to rate overall Teamwork and Strategy. When you map, you will not be mapping for your team, but you will be mapping for groups of skaters, or the team as a whole. Things to rate from 1-10 in Teamwork could be: Proximity of skaters, holding lanes, communication, mobility of walls, awareness, recycling, and protecting edges. Things to rate in strategy could be: Offense, O to D/D to O switch speed, Bridging, Jam line start, power jam defense, preventing recycling. Watch some bouts and make notes of how to describe strategy and teamwork and create your list to test (use the words and ideas that I listed as your example). After you map the data, you can analyze it with your training staff. You’ll be able to see weaknesses very easily. Data doesn’t lie. Create the charts however your brain can deal with the data. After playing around a bit, I decided that I like the bar graph, since I can see distinct lines across. I just made up a mock chart for an example (I picked derby names at random, I didn’t actually rate people on things). 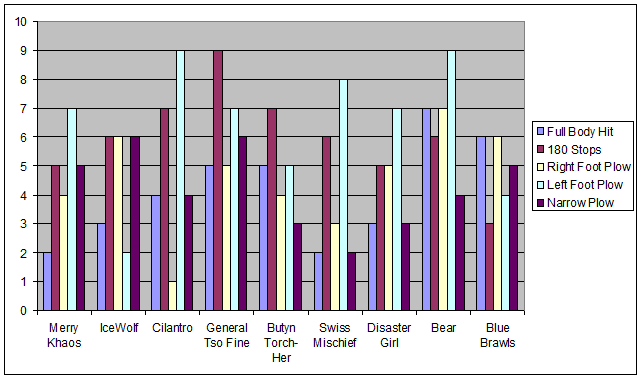 From looking at the chart, you can see that some people have strengths, and some have extreme weaknesses. You do not want to use those as your focus. You want to teach to the median weaknesses. Note: This does not mean ignore the strengths, it just means you now know where to focus more of your training energy. Looking at this chart, I immediately notice that NO ONE has even a 7 on narrow plows. Next thing I see is that while we have a few people strong at left foot plows, the rest are not, and no one is strong at right foot plows. If you have a team that is primarily new skaters, and you are noticing that in the corners of your house, the median score is 1-5 in most areas, than grade on the curve. So you can’t look at the data and go, “Oh man, there are only a couple 7s. WE MUST FOCUS ON EVERYTHING.” Right, ok, so, bring the top grade to 7 and look at the skills from there. If 7 is the top and you’re noticing some skills have more 4/5s and others have more 2/3s, focus on the 2/3s. You do this with all four of your pillars. Identify your team’s overall weaknesses. “But we have too many new skaters to do this!” No. No such thing. If your skaters can’t complete skills they get a 1 on the scale. That’s it. Everyone can run, lift, jump on sneakers. “But we don’t have any place to do the off skates benchmarks!” Really? You know that? I just suggested it and you’re already coming up with an excuse to not do it? Have you called the gyms in your area and asked about it? Tell them what you want to do. Offer them advertisement in exchange for use of their gym to do benchmarks. They can be the “Official Combine Location of the Blankety Blank Roller Vixens”. 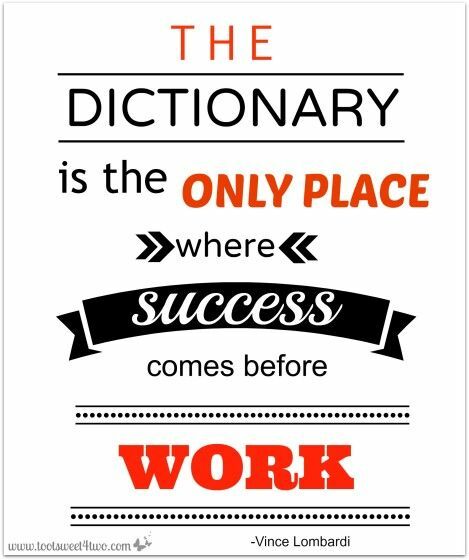 Local, privately owned gyms or franchises are the best place to start. You may want to approach CrossFit gyms about it, because they’ll usually have sprinting space too, and some of those coaches have experience in combines. “But we already spend so much time at derby, we don’t have the time for this! We know how our skaters are, can’t we just use what we know?” Cancel practice for a week and do this. If you want to improve and you’re serious about focusing your training program, you need to know what you’re working with and you need to have an OBJECTIVE view of where you are starting. Without data, provided with the help of people who don’t know you from Adam, all you are doing is continuing old habits. Your current training is based on what you think you know about your skaters. Chances are your advanced skaters are not advanced. Chances are your fresh meat have skills you didn’t realize. “If it doesn’t matter who wins or loses, then why do they keep score?” You don’t have to be a D1 team to want to be successful or to train to be successful. What it comes down to is that this is new, and new is scary. What it also comes down to is exposure. Exposure is scary. Skaters (especially self-proclaimed ‘vets’ and those who like to pop into practice when convenient) do not like being told that they need to improve at something, or that the ‘lowly fresh meat’ is actually better than them at a skill. This is not about belittlement. This is about recognition and understanding. Without it, you cannot move forward. “But my vets will be bored!” No, they won’t be. In any drill that involves team play, the vets should be focused on helping their team mates cover lanes, maintain position, and work on speed change. The vets need to be the coaches through the drills with the new skaters. For any individual skill, the vets need to be focused on cleaning up their own abilities. Encourage the vets to work on precision, quickness, reaction, depth of skill, and visualizing they’re in a game situation. Your vets can plow? They should work on plowing narrower, sharper, stopping quicker, keeping their hips more square, their back stronger, and their head up and looking around while doing it. Your vets ‘know how to roller skate’? Encourage them to make their stride deeper, lengthen their pushes, and focus on breathe work and mental tricks as they go around the track that they can access during game play to calm themselves. Every skater needs to review and practice these fundamentals. These building blocks are not things to check off a list and never visit again. I recommend revisiting these fundamentals often, even after every skater on your crew can rank at an 8+ with them. NOTE: Every skater is responsible for their own progress and should be empowered by their team and coaching to take responsibility for practicing fundamentals on their own time as well as whatever happens in practice. Just like with the health section at the end of the blog, it is not the coach’s responsibility to mother each skater to make sure they are keeping sharp on their skills on their own time. Just because you are working on fundamentals, it does not mean that you need to treat your skaters like 5 year olds, or offer them drills that do not challenge them. Create drills that push your new skaters. Do not assume that because they are fresh, that means they are incapable. Keep your pace lines challenging. Do not skip a drill that works on something that needs to be addressed because someone thinks the fresh meat won’t be able to do it. When Mystery Violence Theatre came to HARD she couldn’t stand on her skates. Through coaching confidence & her own hard work, she now skates for Gotham’s Wall Street Traitors & Bronx Gridlock. You do not get better unless there is a challenge. Making drills JUST above the median level or intensity will push your largest faction of skaters. Dotting in more advanced drills or more basic drills, will keep everyone confident and working hard. Let’s say you are working on edgework! You can start with carving long and slow and then short and sharp. Time these for about three minutes, with all skaters moving around the track. Next, put dummy blockers around the track, facing proper derby direction, near the inside and outside lines. Have them stand NEAR the line, but with some space. Have your skaters carve between the blockers and the line, showing their back to the blocker as they go through (they’ll have to twist their body). After everyone has done it for a few laps, have the dummies take an extra step away from the line, and have skaters get by them by bursting past with a 3 step duck run (which utilizes edges). For newer skaters, put bodies about as far away as the green cone. For the more advanced skaters, go with the red. Then put obstacles in the track – one in the middle of each straightaway, one at either end (trashcans or chairs work great). Have skaters rolling and approaching the object, then bursting around the object with the 3 step duck run. They can challenge themselves to get as close to the object (without touching it) as they can before they burst around it. After this, bring the practice back down by practicing lateral motion, leading with the knees, from line to line across the track. You have started with something very basic, upped the intensity a few times, and then brought it back down to a lower intensity, more precision-based drill. So the moral of the story is – don’t think that your new skaters can’t do it just because it’s harder. You can always offer ways to adjust a drill harder and softer to accommodate for all skaters. “Do we have levels mix together in drills?” Yes and no. I will define who skaters should get with as we progress through a coaching plan. This is something that the coaches need to decide. I will say “vets with tots” or “Get with someone of your skill level” or “find someone on your home team” to define who I want them to work with. You may want to rotate skater partners too, so that way the newer skaters get the advantage of in-drill coaching. Don’t be afraid to spend a longer amount of time on drills and skills. You do not have to rush through practicing; it’s through repetition, repetition that our bodies learn. It takes 5000 SUCCESSFUL repetitions to establish muscle memory. Let them practice in mixed levels, then switch them to equal levels to allow themselves to push and challenge each other. Less talking, less complication, less spending of energy: in roller derby, less is more. Do not spend 30 minutes talking about a drill. Do not spend 30 minutes arguing about a better way to do the drill. Do not allow other skaters to try to bully the coach into doing the drill a different way. Explain the drill, demonstrate, try it, observe it, correct misconceptions, do it again, observe it, tell everyone what you’re noticing, do it again, bring everyone to the center, talk about what you observed, take quick questions, move on. Do not think that you have to bring drills to practice that have 15 steps. Simplification is critical. One piece at a time, and build your blocks. Practice your one foot plows/chomps. Then practice stopping in a two wall. Then practice stopping in a three wall. The practice stopping a jammer in the three wall. Then practice stopping a jammer in the three wall, and having the wall step in front of the person blocking. Build. Do not think you have to be good at every strategy. Vince Lombardi is one of the most decorated NFL coaches of all time not because his Green Bay Packers could do ALL the plays. It was because they did a handful of plays SO WELL that no one could defeat them. By keeping things more concise, you will give your skater tots less to learn (less overwhelming), meaning they’ll be able to advance quicker and get to the level of working with the vets and having everyone be successful. Teamwork, communication, being on the same page, and focus. Less is more. Boxes: Everyone is in a tight box, on the whistle the box completes an action. You can either pick actions before the drill starts, or coach can shout the action before the whistle. Actions can be: rotate right, rotate left, inside line, outside line, hop, front to back, back to front, make a wall, make a line, make a box, speed up, slow down, 180 stop, etc etc etc. Start basic. Work up from there. Double Pace Lines: Especially if your league needs some long endurance work, double pace lines can be beneficial to teach speed control, footwork, skating proximity, and awareness. You can have individuals weave, teams weave and lead, teams race, individuals block, teams weave and hit between the pace line, and more. 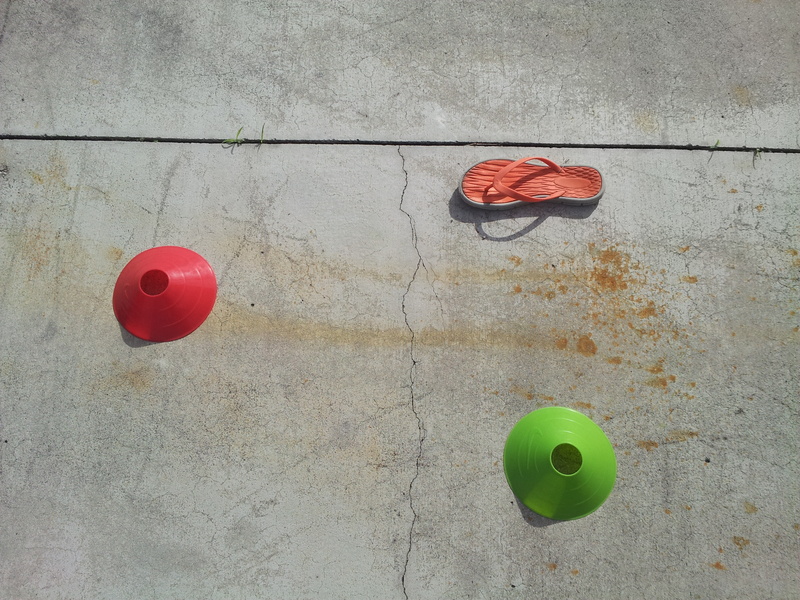 Games: Soccer (use an empty water jug instead of a ball), dodgeball, tag, and more! Get your team distracted from what they are doing by making them do something that isn’t roller derby. It’s amazing how the footwork, stops, awareness, avoidance, cuts, spins, toe stops, and communication improve after just one session. Plus – it’s really really fun! 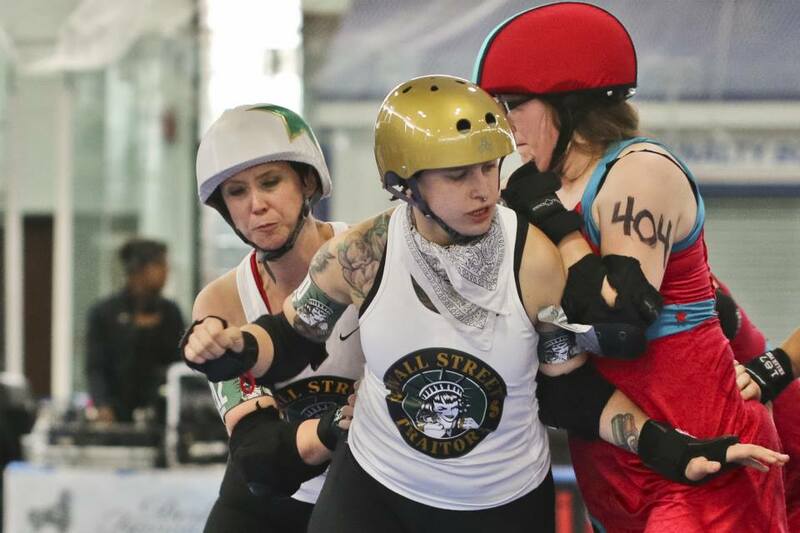 Check out my Put the FUN in Fundamentals class notes from RollerCon 2014! So that “health” corner of the house? Here’s the tough thing: You cannot make people do anything outside of practice time. If a skater wants to live on McDonalds and potato chips and watch 5 hours of television on their non-practice nights, that is their prerogative. Doing the benchmark combine may be the shock some people need to start developing some outside healthy habits, but you cannot count on that (You would think being winded after a lap and dreading the 27 in 5 would be enough motivation, but not everyone motivates the same). YOU CANNOT WANT IT FOR THEM. You can give all the Braveheart speeches you want, but each person makes their own decision of what to do with their body. If you are a decided rec team, what you can do is make recommendations as a training committee of how people can train for roller derby outside of practice. If this blog hasn’t tired you out completely, check out my SHIFTING PERSPECTIVE blog about training for our sport. Some leagues I have come in contact with have an ‘extra practice’ that they must complete each week on their own – it’s a set of workouts that they can do at home or in a gym. More serious leagues (or leagues that want to become more serious) are requiring their all-stars to have gym memberships (these leagues usually also have some kind of agreement with their local gym for discounted rates). In the future, some may require a level of baseline fitness in order to qualify for all-star rosters. Every league is different. Do not be afraid to adopt these health requirements for your league, simply because it is unprecedented in your area. Do not be afraid to not adopt such policies because you do not believe it would be right for your league. Either way, it’s a discussion that the league as a whole may want to have. My first league was not a D1 level of play, but it was understood that we did NOT drink alcohol the week of a bout. Nutrition is as critical a part of fitness as the weight lifting, yoga, land drills, sprints, etc. As a Derbalife coach, I spend a lot of time simply teaching skaters what is and is not good fuel for the body. Creating a voluntary fitness challenge with rewards within your league could be a great way to get your skaters to do something good for them (and their skating) without the league instating rules and policies. It can be something people ELECT to do. I guarantee the people who lift weights and do extra conditioning work outside of practice will, in the long run, excel past those who do not. PROTEIN! HYDRATION! VITAMINS! EATING BEFORE PRACTICE! EATING PROTEIN AFTER PRACTICE! CUTTING DOWN ON SUGAR! These are things that can play a huge role in a skater’s success on the track. Wow you’re still here? Well done!! I hope I have addressed your questions, concerns, and issues at least a little bit. This is a difficult problem for a league to have. If your league is looking for bodies all the time, then you will continually have to rotate in fresh skaters into your tots. It’s imperative that you develop a new skater check list for each player to practice and complete and be tested on before they make their way onto the track with the vets. This way you can be sure that each player that is introduced to your team have spent time building up each corner of their house before they mix it up with more advanced skaters. Remember that you are not the only league going through this training process. Pick goals, plan out your trainings a few weeks at a time, keep communication open, and evaluate and adjust after each chunk of training plans. Skate hard, skate fast, be excellent to each other and do it for THE LOVE OF DERBY!! Like me, Merry Khaos, on Facebook! Like DNA Coaching on Facebook! Want me to come out to your league to help with this stuff? Need nutrition and fitness help for you or your league? Drop me a line at DerbyAmerica@gmail.com and let’s chat about Derbalife.